Gareth Evans has been nominated for the PFA Bristol Street Motors League One Player of the Month for November. 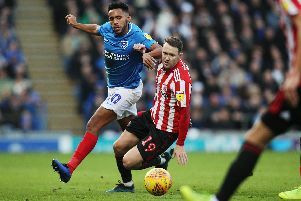 The Blues forward has been shortlisted for the accolade alongside Charlton midfielder Joe Aribo, Gillingham talisman Tom Eaves, Joe Jacobson of Wycombe, Luton’s Elliott Lee and Sunderland winger Aidan McGeady. Kenny Jackett’s men only played three league games last month but Evans was key in each of them. The fans’ favourite was Pompey’s match-winner in the 1-0 victory at Bradford on November 3, as well as scoring the decisive goal in his side’s 2-1 win at Scunthorpe on November 24. Evans also featured in the 2-0 triumph against Walsall three days later. The Fratton favourite can help the ex-Fleetwood man win the prize by voting for him here.